The 74LVT2241 high-performance BiCMOS device combines low static and dynamic power dissipation with high speed and high output drive. The 74LVT2241 device is an octal Buffer that is ideal for driving bus lines. The device features two Output Enables (1OE, 2OE), each controlling four of the 3-State outputs. The 74LVT2241 is designed with 30W series resistance in both the High and Low states of the output. This design reduces the line noise in applications such as memory address drivers, Clock Drivers and bus receivers/transmitters. This is one package pinout of 74LVT2241,If you need more pinouts please download 74LVT2241's pdf datasheet. 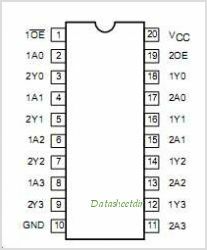 74LVT2241 circuits will be updated soon..., now you can download the pdf datasheet to check the circuits!